There are many important instances of verbal communication that should leave no room for misunderstandings. Through our ISO certified interpreting services, we ensure that speakers of a wide variety of languages and backgrounds are able to easily and successfully navigate these situations. We provide expert interpreters for face-to-face meetings, phone calls, and teleconferencing in over 150 languages, and for various fields, such as legal, medical, corporate, among others. When you expand your business on a global scale, accurate communication is crucial. Language shouldn’t be an obstacle towards securing an overseas partnership or closing your next big deal. We specialize in assisting clients with international audiences; from boardroom meetings where every word counts, to drafting the final agreement, we will be with you every step of the way. Our team of interpreters can take your video conference calls to just about every corner of the world. 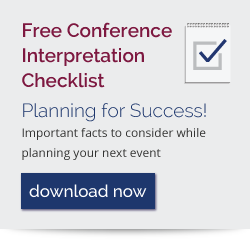 If your conferences are on a larger scale, you may want to look into our Conferences/Simultaneous Interpreting services. Dynamic Language has accumulated valuable years of experience providing interpreting services for many important conversations, in fields in which accuracy is key, including healthcare, legal, education and corporate. This is why we have earned our outstanding reputation within the business community, by always ensuring that the original intent of your message is maintained intact and understood clearly. Our industry expertise proves invaluable when technical language needs to be communicated in plain English – or any other language for that matter. Live telephone interpreting is available 24/7 throughout the United States, so you can call us whenever you need. Whether you require assistance with medical appointments, legal depositions, or sensitive business negotiations, we will provide an interpreter who meets your language requirements and industry-specific needs. Need audio content transcribed into text? See how our transcription services could convert your recordings into text, in more than 150 languages. Additionally, if you have a message for a hearing or vision impaired audiences, please take a look at our deaf and limited vision services.